We love when my Lady makes us homemade dog treats. What dog wouldn’t? I guess ya could say it’s like human kidz a waitin’ on cookies to come out of that big heat box. I have always loved my vegetables, but now she’s done went and turned em into a cookie! That’s like gettin’ a double treat! WOOF! My Lady says these Carrot Dog Treats only have 3 ingredients and takes only 15 minutes to whip up. 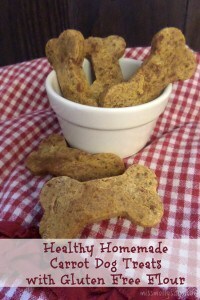 That don’t sound like much trouble to me and your pup will sure love ya for these homemade dog treats! My Lady says these healthy homemade Carrot Dog Treats only have 3 ingredients and takes only minutes to whip up. That don’t sound like much trouble to me and your pup will sure love ya for it! These are just as tasty as the healthy Peanut Butter and Banana Dog Treats. They are another of our favorites! Oh, and did I mention that you humanz can eat em too?! WOOF! In a medium sized mixing bowl, mix together carrots and gluten free rice flour until it is doughy. Add the beaten egg and thoroughly work it through the rest of the mixture. Be sure to not over mix or the dough will be sticky and difficult to work with. Roll dough into small balls and place the balls on a cookie sheet lined with parchment paper. Press cookie dough down until it is about ¼ to ½ inch thick and cut with desired cookie cutter. Let the goodies cool and serve up to your favorite furry friend! Note: These are safe for pet and human consumption. My dog loves treats. I will have to try these! This looks like a nice healthy alternative to store bought cookies. Thanks for the great recipe — easy to make. Going to whip up a batch for my 3 dogs. I am sure that my Sorcha would love these. Thank you for sharing this recipe with us. The recipe sound easy enough. So simple, and a perfect fit with my gluten-free household! hi – is the measurement for the carrots 1 1/2 cups or 1 1/2 baby food jars? These look great! My dogs would be over the moon for them! Thanks for sharing the recipe! That’s pretty easy and has good ingredients. Would make a pooch happy. My dogs would absolutely love these! Thanks for sharing at Merry Monday. So simple! Have to give this a try, thank you! I just got carrots to make a dog treat with. I am so happy that I found this recipe. What a simple,healthy and clever recipe! 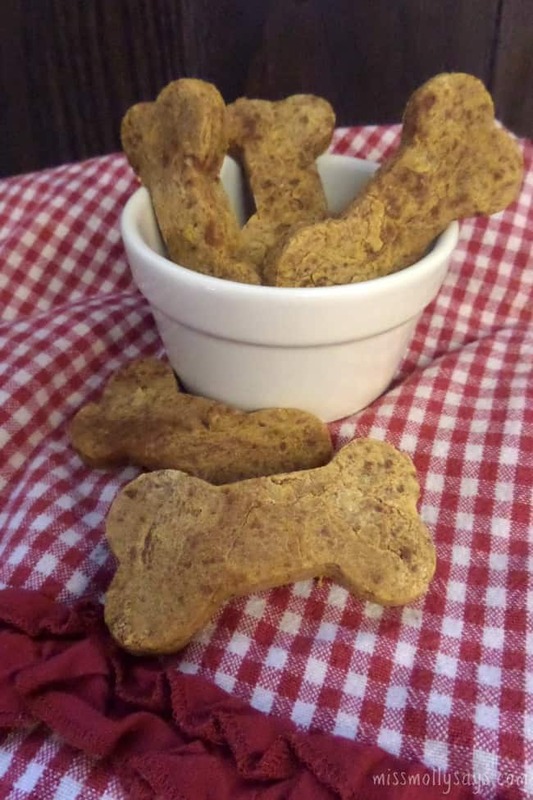 (Homemade Carrot Dog Treats with Gluten Free Flour) These are so cute, I like that they are made with the carrots in them too. I bet my son’s border collie Mia would love a batch of these made up. The would make a great gift for your favorite puppy. My dogs would love these treats. All of them really like carrots.